So after a day of getting to know the Fair Trade organic quinoa growing association APQUISA, I stopped by the office of the Indigenous Governors, another organization I was quickly introduced to by my counterpart. It was Thursday evening. I wanted to meet with the Mallku, the regional indigenous governor and confirm plans for hosting a workshop for women this coming Monday. The Mallku (elected provincial leader), a woman named Florinda Consales, was just on her way out to a weekend long workshop in a community far away and would not be back until Sunday night. She asked that week meet early Monday morning to get everything ready for my workshop. I agreed, and in a flurry of goodbyes, she was off. Women indigenous leaders in red skirts with the Mallku in front parading at the Salinas festival. As the heavy wooden door clicked shut my eyes began adjusting to the dim light of the single energy saver florescent bulb. I was in a long, large, bare cement room with cement ledges lining the walls where people sat. There was a crudely made wooden table piled high with stones, coca leaves and small bottles of grain alcohol. An open case of the regional Huari beer lay on the floor before the desk and the floor was wet with spilled beer and coca leaves. Eight of the dozen or so indigenous governors were there, in their official clothing, plastic cups of beer in their hands. They greeted me heartily with hugs and kisses, called me “sister” and invited me to join them. I was given a cup of beer, everyone else’s beers refilled and we all toasted to the Pachamama, a good time (buena hora), the mountains and volcanoes, and the fortune we had to all be here together; spilling splash of beer on the cement floor each time we thought of something to bless or invite. This was interesting. 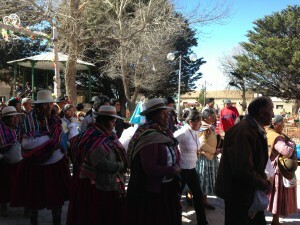 I was very used to the indigenous customs of blessing the Pachamama and sharing coca, beer and alcohol, but I had never seen or heard of women being elected as an indigenous leaders, I had never heard the term buena hora being used, or the custom of people calling each other brothers and sisters, outside of the evangelist church. Being indigenous, I knew there was no way they would have been evangelist since evangelism prohibits the indigenous ways of being. I settled down for a night of interesting exchange, lots of new learning and the jokes and laughter that comes from it. The first joke began of course when I had to ask the leaders if there were evangelical since, I explained, I have family members who were Pentecostal and Jehovah Witness, and amongst their congregants was the only place I knew of where people called each other brother and sister as a way of greeting. I knew darn well that these people were not evangelical, as I explained before, so this got a roar of laughter from the group as they explained that as indigenous people and members of the Earth, we were all brothers and sisters. I later found using this term in my everyday meetings with people in Salinas was very advantageous and immediately had people smiling and opening up to me. Normally I would have addressed someone as Señora, Señorita or Dona. I also learned that people addressed each other mainly on a first name basis. Even the people I interviewed gave little importance to their full names, which traditionally carried a lot of weight indicating one’s amount of indigenousness, place of origin and if they had a legal father or not. This was interesting and I am not sure if it was because of the smallness of the community or a sign of changing times. Hermano Valerio, a man of large stature with an imposing presence that immediately captured ones attention and respect, who sat alongside the Mallku, explained that because we were brothers and sisters and nothing more, titles did not mean anything. He explained that the Mallku was a sociologist and he was an economist, but that those things were not spoken of and had no importance amongst the people. This was a good tip and I made sure never to introduce my self as “Doctora” a title that commanded respect in the city. When asked, I would humbly explain that I was Tamara, an independent social economist and teacher from the US conducting a study of sustainability and quinoa growing also the well-being of women working with quinoa. The next joke came when the conversation moved towards the Aymara lanaugage which I was unfamiliar with, having spent most of my time in Bolivia with Quechua people. 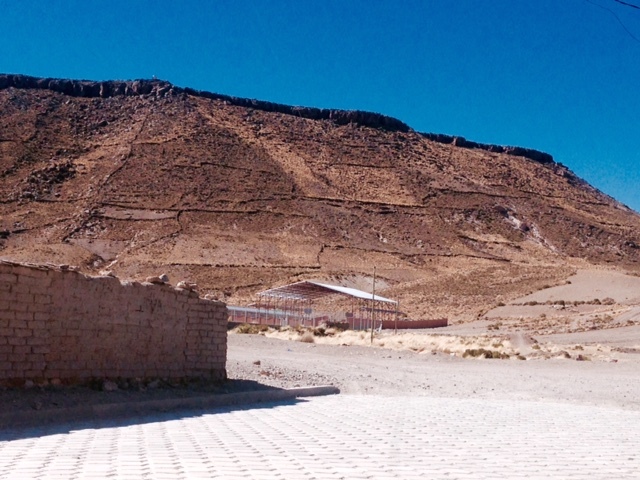 Many people in Salinas speak both Quechua and Aymara, so there was some exchange of phrases and pleasantries in Quechua which I was able to conjure up. But then Valerio declared that the leaders there all were awa tiri, a term I misheard as yatiri. A yatiri is a colonial era legend of an evil spirit in the disguise of a Franciscan monk with a hooded frock who killed people by cutting out their guts. This happened to people who were outdoors in the very early morning who usually had drank too much the night before and did not make it home. The yatiri is a legend from the valley regions and here I was in the highlands, I was not sure if they knew what a yatiti was but I knew they meant no harm to me and I must have misunderstood something so I played along with it and feigned fear that they were yitiri plotting to kill me. A few did know the yitiri legend and quickly explained it to the others, again elicited a roar of laughter. Everyone explained that a awa tiri meant pasturar as in “pasturar la gente,” essentially, to care for people as one would tend their flock or herd, an image often found in the Catholic religion. This led to a long explanation of how they functioned as elected indigenous governors which I found quite fascinating. 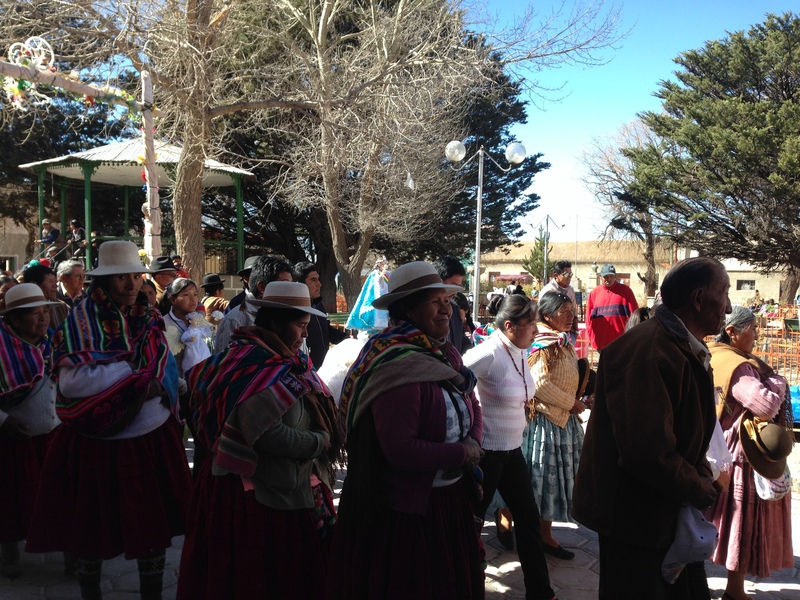 I had read of the new laws that President Morales had instated reviving the traditional ways of governance and had witnesses indigenous governance on my mother-in-law’s rural farm, but this was my first time seeing it in full form. Valerio explained with the nodding approval of the others that most of the elected governors were married couples. I was surprised because as was their tradition, the women governors and visitors sat on one side of the room and the men governors and visitors on the other. Usually, in an unofficial setting such as this, couples would sit together. It had never occurred to me they were couples. I quickly asked the women I was sitting with who their partners were and was surprised at the matches. Valerio’s wife was, Natividad, the the tall quiet woman sitting right next to me with a mischievous twinkle in her eye. They came from Chayuma and Quilli Aretani. The vivacious Eva, who quickly became my closer friend and helped me set up other women’s meetings, was paired with Fidel, an equally gregarious man. They were from Achoco. Another pair was Luisa and Vladimir, a younger couple who came from Tunupa, the community on the other side of the volcano at the entrance to the great salt flats (Salar de Uyuni). They had five children at home, ranging from age 15 to 5 who were caring for each other while mom and dad were gone. Tomas was single, as sometimes happens, the women explained and governed Cora Cora in the same region as Fidel and Eva which apparently was quite a large area. Each pair was responsible for an ayllu, an area made up of about 18 to 20 communities. Each community had an elected Taki or corridor (runner) who responded to the needs of the people. Sometimes there was a land dispute, animal problem, or neighbor disagreement. The corridor would arrive with his poncho and baton of authority to listen to the dispute. Other people of the community would be present and act as historical witnesses and memory. Usually these disputes would be resolved by the people themselves, by remembering past histories. I offered the example of a dispute I had witnessed 15 years ago when my mother-in-law discovered that a neighbor had moved her land marker and tilled a corner of her field as his. She called in the local authority, in this case the Helicotere. Word spread of the dispute, neighbors gathered, the helicotere arrived a few hours later and she explained that the marker rocks had been moved and that an old tree that had marked the property line, though dead many years ago, still had a few roots showing where it once stood. A neighbor confirmed this, remembering the tree from long ago. Others also noted evidence of rocks recently moved. However it was unclear exactly where they rocks had been in the first place. Finally after over an hour of deliberation, beer drinking and earth blessing, the helicotere decided that most of the land was my mother-in-laws’ but some was actually the neighbors and divided it as so, with the rocks moved into a new place, a pole set to make the marker more clear and the rocks painted white so they are well noticed. The indigenous governors approved of the story and noted that every region had their own way of interpreting indigenous law and that in this situation, they would have had the taki (corridor) first try to resolve the issue quietly between neighbors. If ths did not work, then the community helicotere would be called in. If there still was no resolution, then the taki would contact the dirigentes (indigenous governors) to come and resolve the issue. The dirigentes had the highest voice, they explained, even lawyers and legal documents could not overrule their authority. They said their word was protected by the state by the law of Justicia Originaria (indigenous justice) and they had absolute power over the people they represented. That is why they were elected by the people each year, so that the rule was fairly shared by the people who the community trusted. As governors, they explained, they received no monetary compensation for their duties and had to essentially take the year off from work since the demands from the communities were so high. However, being a dirigente (governor) was a position of importance and great pride and no one would turn down the honor of being one. As governors they had certain responsibilities. They needed to be dressed in their uniform. For men it was hand woven black wool pants, a natural colored hand woven alpaca poncho, a fedora stye hat, a whip wrapped about their shoulders, and a hand woven coca bag worn around the neck that was always full. The women had hand woven red wool polleras (full skirts made of many layers of fabric), a colorful aguaro (woven blanket worn across the shoulders to cary things in), a llama hair slingshot wrapped around their shoulders, a bowler style white hat and of course the hand woven coca bag decorated with large pompoms and full of coca. Once their turn as dirigente ended, these vestments of honor were stowed away and the next elected official would purchase or make their own outfit of authority. At the very point of this small mountain-hill is a marker where rocks for good luck are taken for good luck. The last tradition we shared as the night grew late and the festivities outside reached a new crescendo, was that of the rocks on the desk. There are two capilas, or stone cathedrals on the two mountains surrounding the town of Salinas. It is considered good luck to climb the mountains at certain times of the year to bless and bring down a large rock. The larger the rock, the more luck one would have. The large rock on the desk was from that and represented the Virgin The two smaller ones on either side were from other places and represented baby Jesus and grown Jesus. The custom of bringing sacred rocks down from mountains for good luck is a common practice in many areas though the placement of them on the indigenous governors’ desk as symbols of the virgin and Jesus was new for me. Perhaps they were pulling my leg, I thought, though they seemed sincere enough. I remembered back to my interviews that day and how some people proudly stated that they were Catholic, though they often participated more in village celebrations than church ones. The governors now had switched to discussing more pressing matters at hand. They had to walk together amongst all of the communities of the marka (region) visiting each one. How was that to get done? How would the people know when they were coming and have food and housing set up and be ready to great the authorities with respect and admiration? As they deliberated, the turned to me, they were leaving July 28th and returning around August 6th, would I like to join them? It was tempting, what an opportunity! They recently had an anthropology student, Kevin, from Germany spend three months with them and were happy to invite another foreigner along. It was a great way to get to know the countryside, indigenous traditions, interview people at their farms, yet I would also be missing other programed events I had set up for my research. I reluctantly declined. Just in case, I contacted my counterpart in the city of Oruro, explaining the situation. He too, felt it was best I stay on track with my scheduled research. Maybe next time! With a final round of thanks to all, buena hora and all the rest, I slipped out the door and walked the dark streets back to the military base where I was staying, sucking on the big wad of coca leaves in my mouth and thinking back to all that had passed.